Laura and I saved every script rewrite, every e-mail memo, every piece of PR the show generated. Anything Santa Diaries related went into a box. It’s alot of memorabilia. 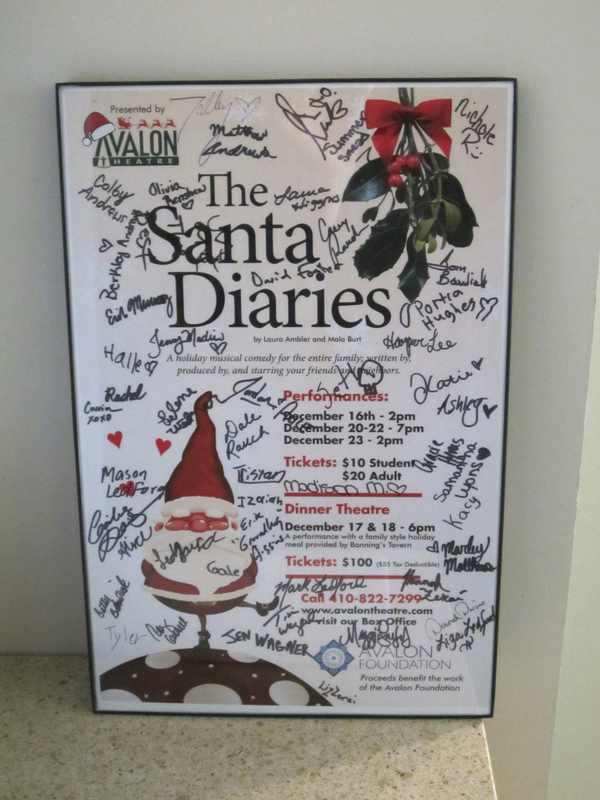 We put some the posters Laura designed in the Green Room and invited cast and crew and staff to sign them. Yesterday we finally got to Ben Franklin to find a frame. Turns out there was one pre-made frame in the entire store that fit the 11 x 17 poster. Must not be a popular size. Actually the small black rim looks great and I now have my poster propper over my desk where I can see it every day. We have a poster for the Avalon, too, and are hoping they’ll put it on their wall with all the other acts that have graced their stage. The stuffed dog is my second favorite piece of memorabilia. Before the Dalmatian Marley costume and stuffed animal were ordered, I was looking for a stuffed animal that could be used in rehearsals. At the St. Michaels thrift shop I found a stuffed moose for three dollars. I bought him, took him home and gutted the voice box inside his chest, remade his ears and removed his antlers, sewed up his mouth and gave him button eyes. The moose morphed into a dog. During one rehearsal Tyler Sabatino (Timmy) came to me upset. One of the buttons had fallen off. I put the button in my wallet so it wouldn’t get lost but a few days later the Dalmation showed up and our morphed moose was relegated to the Green Room where I found him after the show. I considered sewing the black button back on, but decided the missing eye gave the first Marley character. 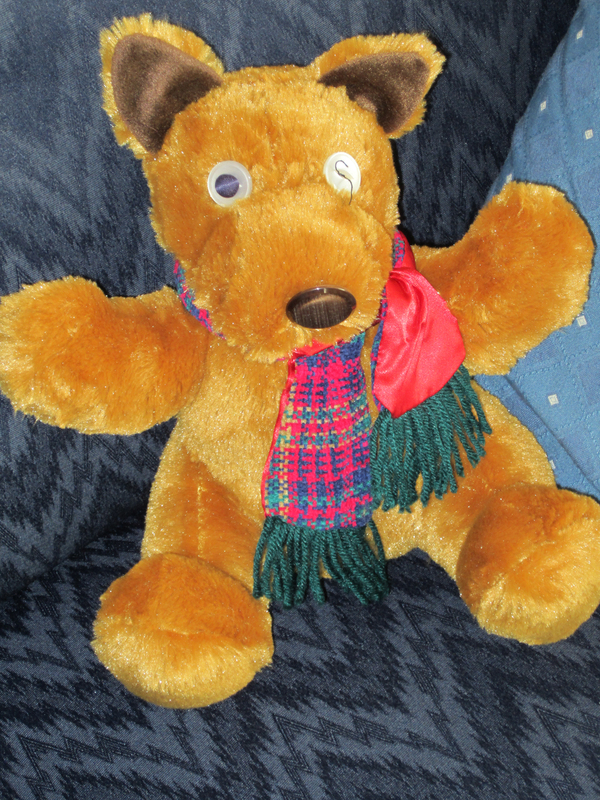 I might create an eye patch for him, reminding me of the eye-patched Marley we wrote into an early version of the show. Marley will also reside in my office. The scripts, press clippings, etc., will go into the memorabilia box for storage. How could I possibly get rid of a single memory.